Warning: version is required and must be specified in source document. Warning: profile is required and must be specified in source document. X3D is the root node for an Extensible 3D (X3D) Graphics model. X3D v3.0 approved by ISO in 2004. X3D v3.1 Amendment 1 approved by ISO in 2005. Backwards compatibility maintained with version 3.0. Core Profile includes no nodes and is provided as the basis for custom componentization. Allowed X3D statements for all profiles are: connect ExternProtoDeclare EXPORT field fieldValue IMPORT IS ProtoBody ProtoDeclare ProtoInterface ProtoInstance ROUTE X3D. Allowed X3D nodes for this profile are: MetadataBoolean MetadataDouble MetadataFloat MetadataInteger MetadataSet MetadataString. Interchange Profile equals the minimum subset of nodes needed to display lightweight compelling content. Allowed X3D nodes for this profile are: Appearance Background Box Color ColorInterpolator ColorRGBA Cone Coordinate CoordinateInterpolator Cylinder DirectionalLight Group ImageTexture IndexedFaceSet IndexedLineSet IndexedTriangleFanSet IndexedTriangleSet IndexedTriangleStripSet LineSet Material MetadataBoolean MetadataDouble MetadataFloat MetadataInteger MetadataSet MetadataString MultiTexture MultiTextureCoordinate MultiTextureTransform NavigationInfo Normal NormalInterpolator OrientationInterpolator PixelTexture PointSet PositionInterpolator ScalarInterpolator Shape Sphere TextureCoordinate TextureCoordinateGenerator TextureTransform TimeSensor Transform TriangleFanSet TriangleSet TriangleStripSet Viewpoint WorldInfo. CADInterchange Profile adds support for CADGeometry component nodes to Interchange Profile. Allowed X3D nodes for this profile are: Anchor Appearance CADAssembly CADFace CADLayer CADPart Billboard Collision Color ColorRGBA Coordinate DirectionalLight FragmentShader Group ImageTexture IndexedLineSet IndexedQuadSet IndexedTriangleFanSet IndexedTriangleSet IndexedTriangleStripSet Inline LineProperties LineSet LOD Material MetadataBoolean MetadataDouble MetadataFloat MetadataInteger MetadataSet MetadataString MultiShader MultiTexture MultiTextureCoordinate MultiTextureTransform NavigationInfo Normal PixelTexture PointSet QuadSet Shader ShaderAppearance Shape TextureCoordinate TextureCoordinateGenerator TextureTransform Transform TriangleFanSet TriangleSet TriangleStripSet Viewpoint VertexShader WorldInfo. Interactive Profile adds interaction nodes (Anchor, KeySensor) to the minimum subset of nodes needed to display lightweight compelling content. Allowed X3D nodes for this profile are: Anchor Appearance Background BooleanFilter BooleanSequencer BooleanToggle BooleanTrigger Box Color ColorInterpolator ColorRGBA Cone Coordinate CoordinateInterpolator Cylinder CylinderSensor DirectionalLight ElevationGrid Group ImageTexture IndexedFaceSet IndexedLineSet IndexedTriangleFanSet IndexedTriangleSet IndexedTriangleStripSet Inline IntegerSequencer IntegerTrigger KeySensor LineSet Material MetadataBoolean MetadataDouble MetadataFloat MetadataInteger MetadataSet MetadataString MultiTexture MultiTextureCoordinate MultiTextureTransform NavigationInfo Normal NormalInterpolator OrientationInterpolator IndexedTriangleStripSet Inline IntegerSequencer IntegerTrigger KeySensor LineSet Material MetadataBoolean MetadataDouble MetadataFloat MetadataInteger MetadataSet MetadataString MultiTexture MultiTextureCoordinate MultiTextureTransform NavigationInfo Normal NormalInterpolator OrientationInterpolator PixelTexture PlaneSensor PointLight PointSet PositionInterpolator ProximitySensor ScalarInterpolator Shape Sphere SphereSensor SpotLight StringSensor Switch TextureCoordinate TextureCoordinateGenerator TextureTransform TimeSensor TimeTrigger TouchSensor Transform TriangleFanSet TriangleSet TriangleStripSet Viewpoint VisibilitySensor WorldInfo. 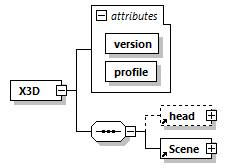 Immersive Profile equals all of the nodes in the VRML 97 Specification, plus various X3D node additions including KeySensor, StringSensor and Scene. Allowed X3D nodes for this profile are: Anchor Appearance AudioClip Background Billboard BooleanFilter BooleanSequencer BooleanToggle BooleanTrigger Box Collision Color ColorInterpolator ColorRGBA Cone Coordinate CoordinateInterpolator Cylinder CylinderSensor DirectionalLight ElevationGrid Extrusion Fog FontStyle Group ImageTexture IndexedFaceSet IndexedLineSet IndexedTriangleFan IndexedTriangleSet IndexedTriangleStripSet Inline IntegerSequencer IntegerTrigger KeySensor LineProperties LineSet LoadSensor LOD Material MetadataBoolean MetadataDouble MetadataFloat MetadataInteger MetadataSet MetadataString MovieTexture MultiTexture MultiTextureCoordinate MultiTextureTransform NavigationInfo Normal NormalInterpolator OrientationInterpolator PixelTexture PlaneSensor PointLight PointSet Polyline2D Polypoint2D PositionInterpolator ProximitySensor Rectangle2D ScalarInterpolator Script Shape Sound Sphere SphereSensor SpotLight StringSensor Switch Text TextureCoordinate TextureCoordinateGenerator TextureTransform TimeSensor TimeTrigger TouchSensor TriangleFanSet TriangleSet TriangleSet2D TriangleStripSet Transform Viewpoint VisibilitySensor WorldInfo. MPEGInteractive Profile defines base interoperability with MPEG4 standards to a small subset of nodes needed to display lightweight compelling content. Allowed X3D nodes for this profile are: Anchor Appearance Background Box Color ColorInterpolator ColorRGBA Cone Coordinate CoordinateInterpolator Cylinder CylinderSensor DirectionalLight ElevationGrid Group ImageTexture IndexedFaceSet IndexedLineSet Inline LineSet Material MetadataBoolean MetadataDouble MetadataFloat MetadataInteger MetadataSet MetadataString NavigationInfo NormalInterpolator OrientationInterpolator PixelTexture PlaneSensor PointLight PointSet PositionInterpolator ProximitySensor ScalarInterpolator Shape Sphere SphereSensor SpotLight Switch TextureCoordinate TextureTransform TimeSensor TouchSensor Transform Viewpoint WorldInfo. The Full Profile corresponds to all Immersive X3D nodes plus all approved/implemented extensions. All X3D nodes and statements are allowed in this profile.